Sometimes, saying one nice thing is enough to make someone feel included. That was one finding in when students, parents and staff completed school climate surveys at Hastings and Prince Edward District School Board (HPEDSB). Overwhelmingly, students said they felt more welcome when they experienced welcoming behaviour, such as smiling, saying ‘hi’ and asking how things are going outside of school. In response, the Board sprang into action with a Tier 1 mental health promotion initiative aimed at all students. It built on the Board’s multi-year plan and beliefs that all students can succeed, that well-being is a foundation of student success and that schools play a vital role in promoting student well-being. 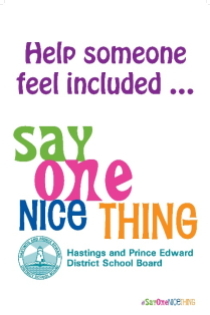 And it was beautifully simple: create a campaign that encouraged students, staff, families and community partners to Say One Nice Thing about each other. The campaign – led by the Superintendent of School Climate & Student Well-Being Services and the team, as well as the Board’s Communications Officer – launched in November 2014 to coincide with the province-wide Bullying Awareness and Prevention Week. HPEDSB posters, postcards and peel-away stickers throughout its schools and Education Centre. These helped raise awareness, gave participants the ability to tailor their own message and brought the point home with stickers that can be used in a variety of ways. The system embraced the campaign: 84 per cent (33 of 39) of elementary schools and 100 per cent (eight of eight) of secondary schools participated. In its first four months, numerous school newsletters featured stories and photos of students engaging in Say One Nice Thing activities. There were also learning connections. Students wrote postcard messages, made videos, wrote and made PA announcements and sang songs to capture the themes of the campaign. Teachers integrated Say One Nice Thing into lessons, as well as displays on classroom doors and bulletin boards. What’s more, the community also began to take notice. Two newspaper articles appeared in the Belleville Intelligencer, and one story also appeared on the County Live Blog. On Twitter, the campaign appeared in 107 tweets and re-tweets with conversations collected around the hashtag #SayOneNiceThing. Needless to say, the success in year one created a healthy foundation for the campaign’s second year. Year two enhanced the campaign with more material and a broader community push. Again, schools and Education Centre departments received posters, postcards, peel-away stickers and Say One Nice Thing lanyards. “Say One Nice Thing highlights our commitment to promoting well-being throughout the organization. Although it is being launched during Bullying Awareness & Prevention Week, it’s really meant to run throughout the whole year,” Mark Fisher, Superintendent of Education, said during the year two relaunch. 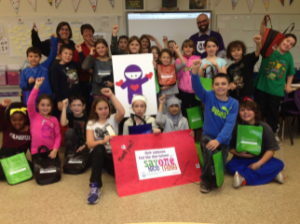 One elementary school gave the campaign its own twist, by augmenting it with an add-on campaign, known as Royal Kindness Ninjas, and was featured on Ontario Morning on CBC Radio One. In its year two relaunch, the campaign spread through virtually all HPEDSB schools and beyond. It now included local organizations such as police and fire departments, City Council and the business community. A new Twitter account was set up (@SayOneNiceThing) in addition to continued use of the hashtag #SayOneNiceThing. Social media even helped the campaign reach further, across Canada.